J.S. 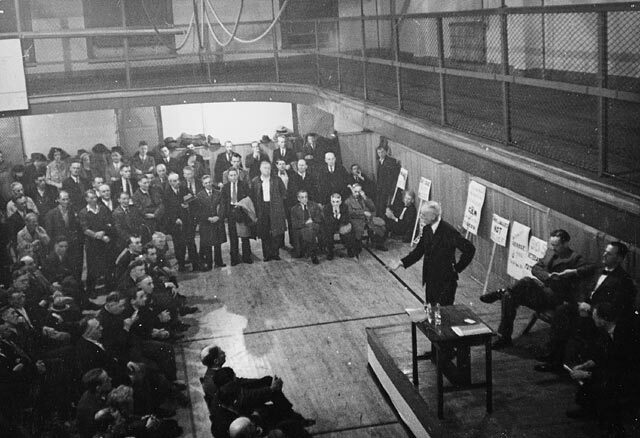 Woodsworth speaking, 1935. Source: Library and Archives Canada, C-055451. The aftermath of the First World War saw a number of competing visions for the re-construction of Canada. The horrors of the war left the young Dominion of Canada politically fractured. The debate over conscription and the controversial federal election of 1917 had divided the country along ethno-national and rural-urban lines. Quebeckers were politically isolated having resisted the push for mandatory overseas service. Farmers were increasingly dissatisfied with both the war and their economic conditions. Workers sought to challenge the conditions of their labour. Returning soldiers felt betrayed as they joined the growing ranks of the unemployed. In this module, you will read two sets of related new political platforms, a series of policy ideas put forth by farmer and labour activists in the immediate years after the war. Many of these drove the development of new political parties in the interwar period. Canadian Council of Agriculture. “The Farmers’ Platform: A New National Policy for Canada” Winnipeg: 1918. Woodsworth, J.S. “Re-Construction: From the Viewpoint of Labor” Winnipeg: Hecla Press, 1919.